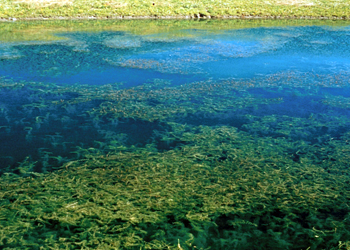 Researchers are going online to stop the spread of invasive species like the Eurasian watermilfoil. Great Lakes researchers are gearing up to fight the spread of invasive species – on the Internet. The idea is to build software to track the sellers of harmful foreign plants and animals and then inform them about the risks they cause to the environment. The Great Lakes Commission received a $400,000 grant from EPA’s Great Lakes Restoration Initiative to develop the system to track the sale of non-native animal and plants that threaten ecosystems. The economic damage to the region from such organisms is up to $200 million a year, according to University of Notre Dame researchers. Many invasive species enter the Great Lakes through the ballast water of ocean-going ships. Some are sold as bait or as aquarium specimens. But another pathway is Internet sales through online pet stores, aquarium plant supply stores, fish stores or individual sellers, according to numerous studies. “Its incredible how you buy invasive species on the Internet. You can buy them from anywhere,” said Reuben Keller, assistant professor at Loyola University. In 2007, Keller and David Lodge, a biologist at the University of Notre Dame, determined that commercial vendors significantly contribute to the spread of aquatic invasive species into the Great Lakes. They bought harmful species at nurseries, pet stores and fish markets in Chicago and the southeastern Great Lakes region. And they found them for sale on the Internet. States prohibit the sale and purchase of these invasive species, but online purchases are unregulated, according to Keller. Laws vary across the country. “Unfortunately some species that are prohibited in one state might not be prohibited in another. You can’t control the sales,” Keller said. The researchers obtained samples of invasive plant species banned in the Great Lakes region including Eurasian watermilfoil, water chestnut, yellow flag iris, as well as fish such as live Asian carp. Some of the Internet purchases came from states outside the region including Texas, Florida and California. 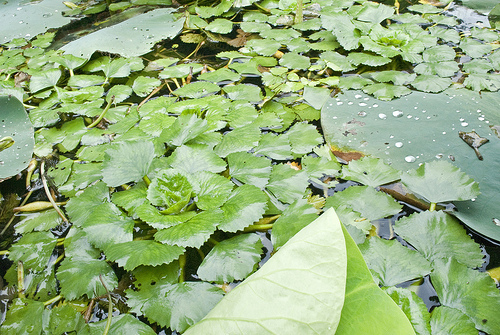 Aquatic invasive plants are a booming business among buyers for water gardening, Keller said. The researchers also discovered that many aquatic invasive species sold online and in stores are often misidentified. “In many cases both sellers and buyers don’t know that they are selling or buying illegal species,” Keller said. That makes both consumers and sellers unwitting participants in this illegal trade, Keller said. A U.S Invasive Species Advisory Committee report anticipates a 13.5 percent increase in global Internet commerce by 2015. That indicates the potential increase in the online trade of live organisms, including invasive species, the report says. The EPA grant allows the Great Lakes Commission to create software to search websites, Internet storefronts and chat rooms soliciting trade in the aquatic species prohibited in the Great Lakes. “We will contact sellers identified through this project and provide them with information on relevant regulations and potential risks associated with the harmful organism that they sell,” said Erika Jensen, a senior specialist at the commission. The list of illegal plants in the Great Lakes region include hydrilla, reed canary grass, purple loosestrife, curly pondweed, Eurasian milfoil, frogbit, and cattails, accordingto the EPA. There are about 25 non-native species of fish listed, including round goby, sea lamprey, Eurasian ruffle and Asian carp. In addition to sending automated messages to potential buyers and sellers, the software will archive data. That will let the commission identify and track the sellers and types of invasive species most often sold online, Jensen said. Similar software developed by North Carolina State University is used by the U.S. Department of Agriculture’s Animal and Plant Health Inspection Service. It searches for online sales of insects, weeds, mollusks, fruits and vegetables and for animals that can transmit life-threatening diseases to people. “We hope to develop a system that will be available for long-term use in other agencies working to protect the Great Lakes,” Jensen said. The project will be implemented over the next two years. It will be made available to other agencies or researchers working to prevent the spread of harmful organisms in the Great Lakes. I’ve been at this 7 years, I hear ya. I’m tired of being lied to, it seems letting the carp take over gives our fishery managers an out from the big lie. Versus restoring native fish people might ask why this wasn’t done before? The official plan is to keep alewives dominant in Lake Michigan, whole problem. You would think turning alewives back into an invasive species would be easy. Try it once. Tom Marks Chair of the Great lakes Sportfishing Council New York, may be of help to you. He’s got a thing going with ballast water and he mentioned the minnow thing a while back. Here they wanted to test every truck load of minnows and we have to carry a reciept where we got them. VHS minimal impact compared to overall, and can be addressed to make it irrelevant. Alewives kill more fish in a year than VHS could kill in a thousand years. Tom I did see that and was also depressed by it, as algae, bacteria, and virus are closing beach’s and yet they are promoting its spread while the Coast Guard plan under this administration is allowing a pass to ships used on the Great Lakes to spread it with their ballast water throughout all the lakes. Having grown up spending many of summers swimming, fishing, in the St.Lawrence River I am very upset about the destruction invasive s have had on this pristine water that holds some of my best childhood memories. What I find interesting in my business in NY is that they go after the small bait fish shop rather than address the interstate transportation of fish and water which is a states rights issue as is ballast water, believed to have moved VHSV (Fish Ebola Virus) into the Great Lakes as a salt water mutation. As most of the reared bait fish in the United states come from Arkansas and the transport water could be a source of some of the carp DNA or other disease created by water changes made in transport I found it quite interesting that Senator Clinton, who according to an article on Cornell University’s web site was involved in NY’s new 2007 bait fish regs, when they ignored the transport water in their final regulations. I tried to approach our Department of environmental Conservation before Mrs. Clinton recorded involvement about the transport water issue during the 2007 formulation of the new bait fish regs, and suggested that bait fish could be safe if they would worry about the transport water disposal and observe the fish’s condition as they entered the state, plus require a point of origin to destination manifest, and was soon temporarily shut because they were writing the regs saying you could not have a bait shop on the same piece of property contiguous with a pond having fish in it, which is my what I have. Ironically according to Cornell s web site article Mrs. Clinton helped to modify the reg to prevent small shops from going out of business and after the formulation of the new regs I then received a letter from the Department of Environmental conservation telling me there was “good news” they were removing the word pond, this was NOT my reason for approaching the DEC. I used to wholesale and imported bait fish from Arkansas in the 1990’s and at the time when they emptied a tank, I would fill it up with my spring water so they could split up fish in the remaining tanks before moving them to their next destination. The trucks also sometimes had Asian carp, on board for food delivery in NY city. I have learned much about invasive s since then and still believe bait fish can be used and moved safely with the right regs. (Preferably as with ballast water a national approach) Thankfully the wholesaler I deal with understands the problem and has told me he supports a point of destination plan, and deals mainly with a truck coming directly from Arkansas and is careful about the water disposal so it dose not make its way back into our states water. Although I believe the majority of anglers are quite upset about invasive s , but many enjoy using bait fish I am sure that you can understand how this invasive problem has and still may effect my livelihood as well as my love for the river. Tom this is sad, I was not aware of this and will check it out. I have read many of dumb comments in support of Asian Carp considering them a good thing. Sadly our politicians will not act because the media is silent about invasive species in general. Politicians rarely act or take a stand if it is not an issue that will create more votes or a donation. Even though respected public officials will occasional speak out on issues the broadcast media in general avoids them, and when they occasionally do address the issue the forum always seems to be one that dose not address the general public, but a targeted audience. While watching The Latin View on PBS, Sonia Sotomayor, before becoming a supreme court justice, spoke about invasive s being one of the major threats to our country, although I do not remember her referring to Asian Carp or ballast water specifically her warning made no difference, as we still have the dangerous threat of Asian carp along with lax ballast water regulations providing an avenue for virus, bacteria, toxic algae plus other invasive s threatening to cause permanent damage to all Americans waters. Perhaps if there were enough people who cared enough to try and drowned out all the people calling calling them tree huggers etc. a massive internet campaign could be used to educate the general public about Asian carp and ballast water, replacing the national broadcast news media, which is avoiding the problem with only token coverage. Perhaps if there were enough internet savvy people using social networks to point out all the dangers associated with invasive species it would force our politician to act or be out of a job. I agree with you that if wild Asian carp are being fostered as a marketable economic opportunity for Illinois it is the worst and I believe that with the political environment forecast to remain the same the “final standards” created will be more of the same half measures creating a legacy of invasive s.
I would like to thank this site for their vigilance and education, it is a site where those who manage it care deeply. The new Asian carp processing plant about to open in Grafton Illinois says the jobs will be permanent. This is more dangerous than any illegal trade. These people will now protect the asian carp, we can’t stop carp jobs! Illinois is gearing up to have a permanent Asian carp population next to the lake. My understanding $10 million invested so far to do that.